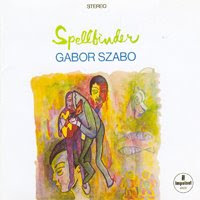 Gábor Szabó (March 8, 1936 - February 26, 1982) was a jazz guitarist, one of the most original 1960s guitarists, mixing jazz, pop-rock and his native Hungarian music. He was born in Budapest in 1936 and began playing guitar at the age of 14, inspired by jazz music on the Voice of America broadcasts.He escaped Hungary and moved to the United States in 1956 and attended the Berklee School of Music in Boston. In 1958, he was invited to perform at the Newport Jazz Festival. From 1961-1965, he performed with the Chico Hamilton quintet. In the late 1960s he co-founded, along with Cal Tjader and Gary McFarland the short-lived Skye record label.His album for Impulse!, Wind, Sky And Diamonds, features "The California Dreamers", a vocal-ensemble consisting of Ron Hicklin, Al Capps, Loren Farber, John Bahler, Tom Bahler, Ian Freebairn-Smith, Sally Stevens, Sue Allen and Jackie Ward.His playing incorporated elements of folk music from his native Hungary and rock music's use of feedback. His composition "Gypsy Queen" became a hit for Santana in 1970 (see Black Magic Woman). During his solo career, he performed with artists such as Ron Carter, Paul Desmond, Lena Horne and Bobby Womack.He died in Budapest in 1982 from problems with his liver and kidneys while on a visit to his homeland.